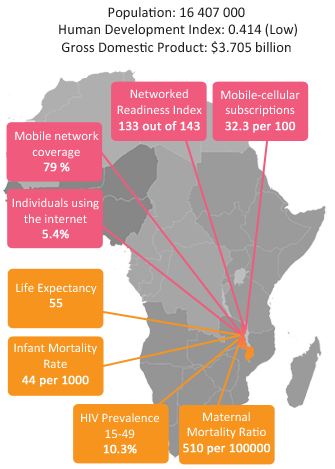 Malawi has a low World Economic Forum’s Networked Readiness Index (132 of 139 in 2016), and faces a number of challenges in implementing digital health programmes, including the fact that it has infrastructure challenges. Nevertheless it is making key in-roads with regards to digital health, particularly through the use of mobile phones with the Ministry of Health leading a national mHealth working group to co-ordinate these efforts. The eHealth Strategy aims at building the foundations for ICT infrastructure, implementation of ehealth solutions, facilitating adoption of new ehealth solutions and enhancing governance in the implementation of this strategy. continuous professional development using e-learning. cStock is the mHealth component of the Ministry of Health’s Enhanced Management approach to supply chain and stock management which was scaled up to all 29 districts by October 2014. Health workers are able to update stock information via their mobile phones. cStock automatically calculates the resupply needs and communicates these to decision makers.